I hope everyone has been finding ways to stay cool during this heat wave in eastern central Canada (and for that matter, the rest of Canada and east-coast USA). It’s been hot and humid lately, and with humidex reaching mid 40s, my kitchen has been closed. I live in a non-air conditioned apartment, so there was no way I was going to turn on the stove only to make my 30+°C apartment even hotter. 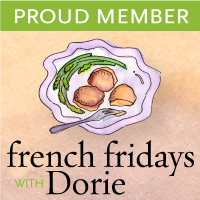 I’ve been eating a lot of salads to get by—the perfect season to enjoy them with so many fantastic, Ontario-grown vegetables now popping up at farmer’s markets and grocery stores everywhere! What I love about salads is that they’re simple and their combinations are endless, making it one of the easiest things to experiment with and put together new flavours you otherwise wouldn’t have in the past. 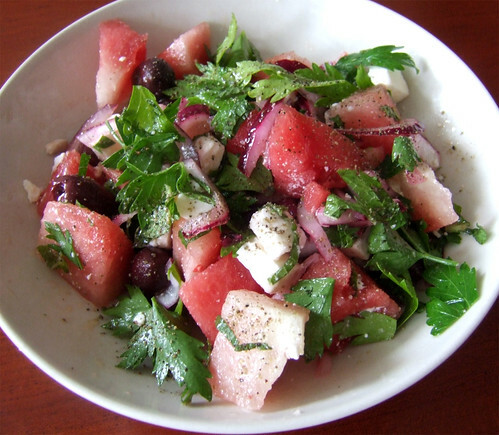 I saw Nigella Lawson make this Watermelon, Feta and Black Olive salad on her TV show quite a few years back and was instantly intrigued by the combination of flavours. Cool, sweet, juicy watermelon. Salty feta and olives. Throw in lots of fresh herbs from your garden and you’ve got the perfect summer salad! 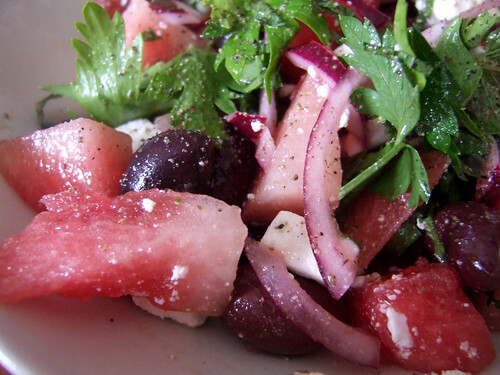 It is so refreshing and light, and the sweetness of the watermelon goes so well with the salty, creamy feta and slightly bitter olives. Posted by Bonita at 9:08 a.m.